In any application it is likely you are going to need access to some "secret" data, connection strings, API keys, passwords etc. It is essential that the applications that need them can access these secrets, but that they are also kept secure. 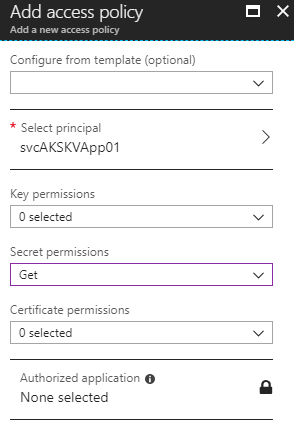 One way of doing this is using Azure Keyvault; this is a secure store which can hold secrets, keys and certificates and allow applications to access them securely. Generally, Keyvault Secrets are accessed by the application making a call to the KeyVault API and providing the appropriate credentials (username/password, certificate or managed service identity). This approach also works when running an application inside a Kubernetes Pod (assuming the Pod has access to connect to KV). Kubernetes also has its method for providing access to secrets. Secrets can be created using Kubernetes and then exposed to the Pods either as environment variables or as volume mounts. This approach has some advantages, as it means the application does not have to call out to external services or authenticate, it just accesses the secrets provided directly to it, and only those secrets. It also removes any requirement for the app to understand how to access key vault. Up until now, if you wanted to expose secrets stored in Azure Keyvault to a Pod as Kubernetes secrets, you had to copy the secrets and recreate them in Kubernetes, resulting in both extra work and having two sources of truth for these secrets, which can quickly get out of sync. Microsoft has recently opened up a project on Github to provide a way to mount Keyvault secrets directly into pods, as with ordinary Kubernetes secrets. This solution allows the application to access the secrets as a mount point without any understanding of Keyvault, but still have your single point of truth being the Keyvault repository. In this article, we will take a look at how you can implement this. Your service principal has access to all instances of a specific type (secret, key certificate) in the vault, so we need to scope our Key Vault to ensure that there are only secrets in this vault that the app needs. It is not possible to scope an identity only to be able to see some values of a specific type. You can scope it to only see a specific type, so only secrets, keys or certificates. When creating your Pod, you do decide which secrets to mount, so you can only mount specific ones. However, the person creating the Pod can decide to mount any secrets the SP has access to. Make sure you scope your secret only to the namespace where your application exists so that it can only be accessed there. This solution makes use of a feature in Kubernetes called "Flex Volumes". Flex Volumes are a feature that allows you to run an arbitrary script to create volumes. Before Flex Volumes, if you needed to create a custom volume type, you had to create a new Storage Provider and get this merged into the Kubernetes repo, which is quite difficult. With the advent of Flex Volumes, we can now create custom volume types just by creating a script that is loaded onto the Kubernetes hosts. This solution makes use of Flex Volumes to create a volume that reads secrets from Key Vault. A daemon set that runs on all hosts. This Daemon set takes care of placing the Flex Volume provider scripts in the right place on the host. Once your Service Principal has been created, it needs to be granted rights to access Keyvault. There are two places this needs to be done. 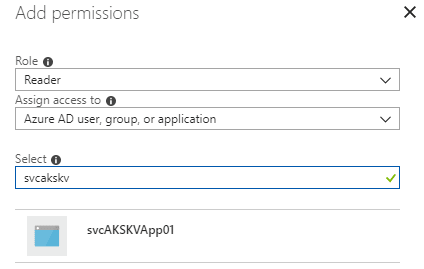 Firstly, you need to grant the SP read permissions on the vault its self, using Azure RBAC. You can do this through the portal, by going to the IAM tab on the Key Vault object and adding the SP to the reader role. Now that our SP is set up to access the Keyvault we need to create a Secret in our Kubernetes cluster that contains the details of the service account. We are going to scope this to our applications namespace to ensure it can only be used there. To use a Flex Volume, the configuration script that is used to create the volume needs to exist in a specific location on the worker nodes. To achieve this, this solution makes use of a DaemonSet (a pod which runs on every node), which mounts the location on the worker node and copies the required files. We need to deploy this DaemonSet before we can start accessing KV in our pods. To do so, run the following command against your cluster. This command creates the DeamonSet using the definition in the project Github repo. If you prefer you can, of course, download the file and refer to it locally. Once these pods are all running, we are ready to start accessing secrets. Now that we have everything set up we need to configure our Pods to connect to Key Vault. We do this in our Pod YAML file by defining that we want to use a Flex Volume (or multiple Flex Volumes) and providing the variables that it needs. The first part of the file is a standard Pod definition, which includes defining that we want to create a volume, and where we want to mount it. In this example, we create a volume called "secret-1" which is then mounted to the pod at /secret1, nothing new here. If we move into this folder, we should see a file with the name of the secret we mounted, in this case, "appsecret1" and if we output the value of that file, we see our secret value.